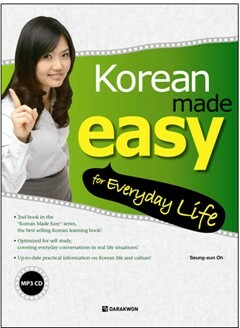 Produktinformationen "Korean Made Easy for Everyday Life (Book+MP3 CD)"
Korean Made Easy for Everyday Life is designed for intermediate-level Korean learners to enhance their speaking abilities beyond their present level. The learners can learn 50 useful expressions in Part1, and they can also learn 24 common situational encounters in Part2. The learners can apply each expression from Part1 in speaking exercises in the Dialogue sections in Part2. - The best thing in this book is that it does not only focus on the learning of the Korean expression, but also on the listening, reading, writing, and on applying all of them. - The book is structured with dialogue practices and many various features such as Grammar in Focus, New vocabulary, New expression, Quiz Yourself, Flashback, Pronunciation Tip so that readers can understand and remember better. - One can learn a variety of vocabulary and expressions used in authentic materials in Korea. - One can apply these to real-life situations through try it out section. - Director's commentary section also provides insights and information on the Korean lifestyle and culture. Weiterführende Links zu "Korean Made Easy for Everyday Life (Book+MP3 CD)"
Unser Kommentar zu "Korean Made Easy for Everyday Life (Book+MP3 CD)"
Kundenbewertungen für "Korean Made Easy for Everyday Life (Book+MP3 CD)"